Family vacations are all about unwinding, but what about unplugging? In an age where our devices join us poolside and WiFi is omnipresent, hotel chain Wyndham Grand is bent on helping guests create family memories, offering a 5% discount for opting into their Reconnected package. Lock up your smartphones, in a provided lock box that can be opened for occasional, timed periods to check back in on the rest of the world. Meanwhile, the hotel encourages guests to enjoy old-school quality time, with family-focused activities like architect-designed blanket fort kits, a backpack full of storybooks and shadow puppet how-to’s, a room service menu designed for bedtime (gourmet s’mores and night caps for parents), and the use of an Instax camera to snap pics of memories as they’re happening. 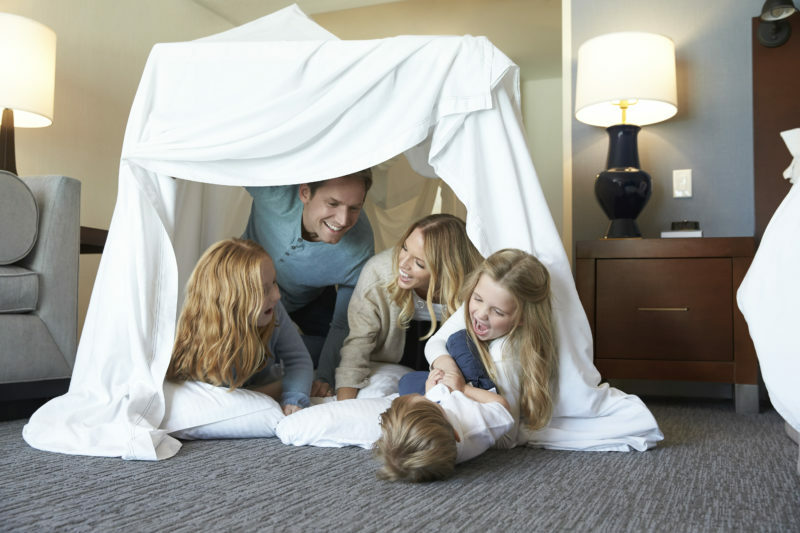 While many family-friendly hotels and travel programs provide adults-only activities and separate childcare via kids clubs, the Wyndham team hopes the pilot program will create a shared experience for parents to put away their devices and reconnect with their number one priority.